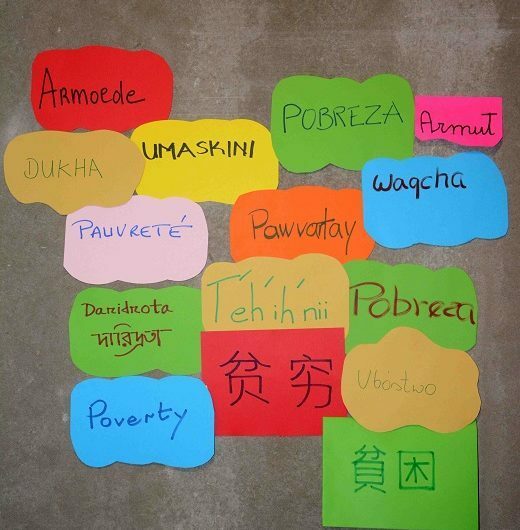 In May, ATD Fourth World will announce the results of a major international research project on “Determining the Dimensions of Poverty and How to Measure Them”. This research, conducted in partnership with Oxford University, includes perspectives from people who live in poverty in each of the six countries studied. Elena Lasida, author of this article, is a professor at the Catholic University of Paris and co-facilitator of the French national research team for the international project. Poverty has increasingly become a focus of social struggle in our world. Reducing and eliminating poverty are usually included in the objectives of each country’s political programmes. Since 2000, this is also true of the United Nations Development Agenda. It was a great achievement to define what was initially called the “Millennium Development Goals” and from 2015 onwards, the “Sustainable Development Goals“. For the first time, the international community set itself quantified targets to reduce poverty at the global level. The joint definition of these goals has freed up resources and supported poverty reduction policies on a larger scale. This is welcome news indeed. the aim of reducing poverty has reinforced the reduction of “the poor” to the category of “object”. Poverty is becoming more visible in statistics and policies, which makes it possible for anti-poverty programmes to be more effective. But at the same time, this objectification of poverty makes the people enduring it less visible. Above all, we see what is lacking: people living in poverty lack food, housing, clothing, work, health care, training, etc. And we see less and less the person living in poverty with all the complexity associated with human life, marked by needs to be met but also by skills to be deployed. The subject becomes an object. Since it was founded, the International Movement ATD Fourth World has been working to counteract this objectification of poverty. Its members are convinced that efforts to overcome poverty must be undertaken with people in poverty and not for them. ATD Fourth World was launched in 1957 in France, at the emergency housing camp of Noisy-le-Grand, starting from a strong intuition that Joseph Wresinski had that would change the public view of people living in poverty. He found himself confronted, not with individual social cases, but with a people whose members had the same way of dealing with deprivation. The same anxiety about eviction and placement of children in foster care, and the same experience of underemployment and assistance. How can we take into account the specific knowledge of people experiencing extreme poverty and rethink anti-poverty policies derived from their knowledge? To move forward in this direction, ATD Fourth World has launched a remarkable project: to consider the person experiencing poverty as a “researcher” who can contribute to creating knowledge about poverty. This seems like madness in a world where only academics are recognized as keepers and creators of knowledge. But we know that only those who dare can change the world. This daring took the form of a series of unlikely encounters. First, ATD Fourth World partnered with an indisputable player in the academic world, Oxford University, guaranteeing the scientific dimension of the approach. Thus the world of activism and the world of theory found themselves working together. This created an unlikely encounter between the logic of effective action and that of complex reality. Second, since knowledge always aims to be universal, ATD Fourth World wanted to give this research an international dimension. Six research groups, one in each of six countries, are working on the same project. It involves three northern countries: England, France, and the United States; and three southern countries: Bangladesh, Tanzania, and Bolivia — the global north and the global south, with very different realities of poverty and very unequal research resources, coming together in an unlikely meeting. Finally, the working method is based on an approach that ATD Fourth World has been gradually implementing and practicing in its Fourth World people’s university: the merging of knowledge. This entails another unlikely encounter between three different sources of knowledge: the knowledge resulting from the experience of poverty; the knowledge generated by professional action to support and assist people experiencing poverty; and the knowledge derived from studying poverty at the academic level. The approach based on the merging of knowledge reverses three major principles of scientific research in general and research on poverty in particular. First, the object becomes a subject: people living in poverty regain their status as persons. Even more, they become actors and not only victims of poverty. Second, the resource becomes a source: poverty is not reduced to data to be collected in the field; it is conceived as an experience that provides unique and essential knowledge to overcome it. Finally, the dynamic of bringing together different kinds of knowledge results in reciprocal learning. In the merging of knowledge, we do not put the different forms of knowledge in competition; we “learn to learn” from the knowledge of the other. It is unclear whether this approach will produce more effective tools to overcome poverty. But regardless of its outcome, it already brings about a radical paradigm shift; namely, learning to say to the “beneficiaries” of social action: “Never again without you”. Three Cities Social Centre in Poitiers.